All of the following comments were un-solicited. 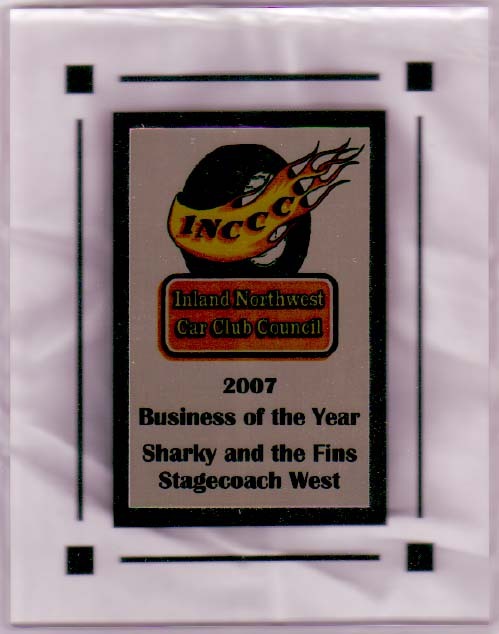 We were awarded "2007 Business of the Year" by the great folks at the Inland Northwest Car Club Council. Thank you for the honor and we are looking forward to the next dance! The award. The award ceremony. "Saturday night features the return of a group the Rally Chairs enjoyed so much at the Spokane Rally, they insisted we invite them back to Gillette this year...StageCoach West. They know how to have a good time! So get out there and dance!" "We sure did enjoy having you with us. You made it the best day ever! We are going to probably grab some friends and come and hear you play more often. My uncle wanted to take you everywhere they went for dancing. (He lives in Olympia.) Take good care and thank you so much again! It was wonderful!" Bonnie and Eppe B. -Wedding. "Once again - you guys were awesome! Thank you so much for doing our dance again and bearing with me with all the changes etc!! We raised almost $3000 after expenses." Marilyn, Cancer Benefit Dance at the Coeur d'Alene casino. "The entertainment each night in the beer garden was great, especially the blues on Friday night and Stagecoach West on Saturday night." From the Gateway BMW Newsletter V32 Number4, reporting on the week-long national rally attended by 6000 members in Spokane in the summer of 2004. "So sorry for the delay in paying, thought we'd paid you in advance. Group says you were great and would recommend you to anyone." Julie S.
"Thank you for helping create such a fun evening!" Karen O. "We love your music!! Keep up the great sounds!" "Please record your very danceable music and make available. Send a couple of tapes to Arlie W. ..."
"Thank you so much for your work. Our evening was perfect with all of us together. The excellent band also helped to make it great - they're fantastic!" Sherri S.
"We had a wonderful event, and a very successful one raising funds for our Women's Center and Children's Village. We enjoyed your music so much. We hope to have a chance to dance to your music again. Many people asked about hiring you. The Children's Village called today. They were so excited because they will be able to open their second home after two years of being vacant due to the lack of funds. We thank you so much for your part in making all this possible. Marge and Tom M."
"To Whom It May Concern, April 22, 1996 the Inland Northwest Wine Experience was held at the Coeur d'Alene Resort. After a very successful live auction, Serenade entertained the audience. I found Serenade's music covered a varied generational assortment. All ages enjoyed dancing to Serenade's arrangements. They are professional and very accomplished musicians. I would recommend and hire Serenade again for any type of function." Thomas M.
"This is to express our sincere thanks for the outstanding performance your band gave for the First Annual Joan Roberts Memorial Dance of the Mead Education Association. The music and energy your band provided made the evening a totally enjoyable occasion for all who attended. I would add that this was my first opportunity to hear Stagecoach West in quite some time, and I was very impressed, as were others. You band continues to be a strong favorite among teachers in Mead." Ted K.
"I do want to extend our thanks to the band from everyone at the party. They made it a great success. 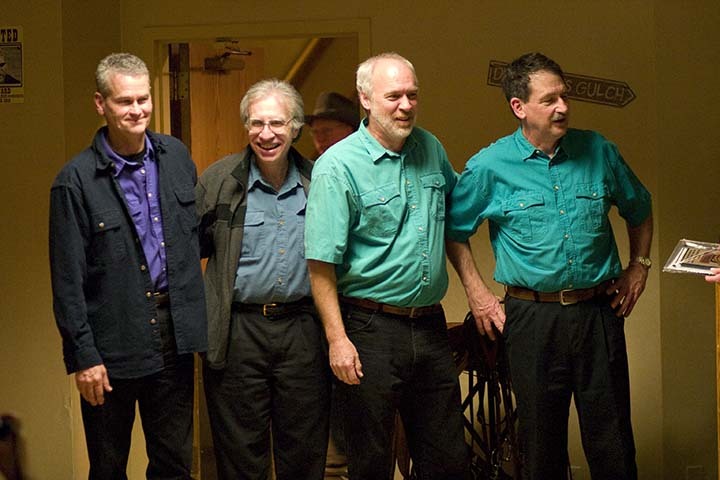 I talked to Jim about booking them again next year..." Sherry S.
"Thanks a million for coming to Cure d'Alene to play for this year's Champagne Ball. Needless to say, everyone had a great time and it was your great music that did it. Sincerely, Don and Pat O."